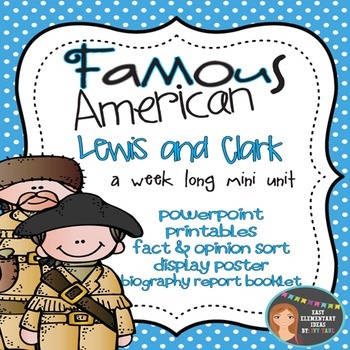 This is a weeklong unit on Famous Americans Lewis and Clark! 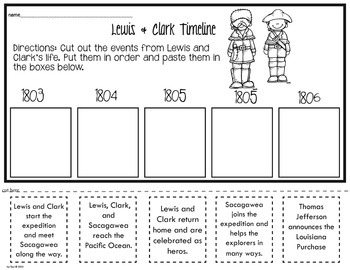 Unit covers Lewis and Clark as explorers on the famous Lewis and Clark Expedition. 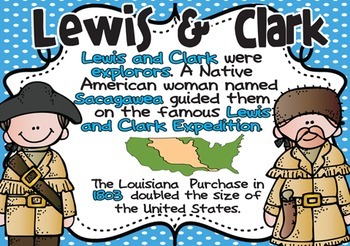 Unit also covers Native American Sacagawea and ways she helped Lewis and Clark on the expedition. 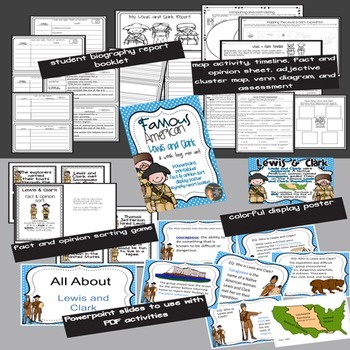 Students will enjoy coloring the Louisiana Purchase, comparing and contrasting their life to Lewis and Clark's, cut & paste Lewis and Clark timeline activity, describe the famous explorers using character traits, write a mini biography report on Lewis and Clark, and more! Save 25% by purchasing the Famous American Bundle! What is the difference between a fact and opinion? How can I put events in order? What character traits describe Lewis and Clark? Check out other Famous American Mini Units! Become a follower for monthly specials!